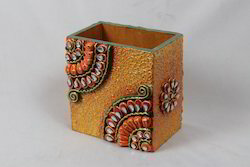 We are involve in offering superior quality Paper Mache Pen Holder in multiple designs to our most reliable clients. These products are available in market at most affordable rates. The designs used in paper mache naqashi are very intricate and their application requires a great deal of skill and accuracy. The patterns are painted free hand. 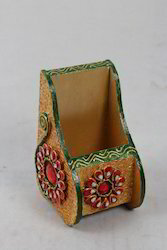 We are engaged in the manufacturing of a unique range of Paper Made Mobile Holder. Offered range is available to our clients on reasonable prices. Looking for Paper Mache Pen Holder ?